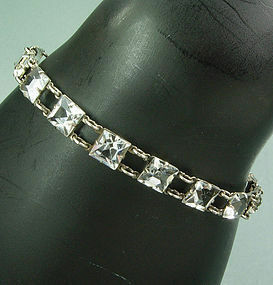 Beautiful glittering sterling silver 1920s Art Deco bracelet with square cut openback unfoiled stones which are either lead crystal paste glass or rock crystal, prong set in frames with very soft repousse decoration on the backs. Early spring ring clasp made with a collar instead of a thumb tab. Clasp is marked STERLING. 6 3/4 inches wearable length and 1/4 inch wide. Excellent condition. Display form is life size. Photos enlarged to show detail.